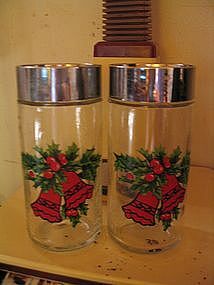 These shakers are not marked, but I have a set of 1987 Anchor Hocking Farm Country shakers the same size and with the same lids, but just can't be positive if these are the same manufacturer. They are 4 3/4" in height. No chips, cracks or breaks to the glass or lids. The finish to the lids is beginning to show age related wear. I need your zip code to calculate the postage.